Meet Sophie, Payton and Koda. 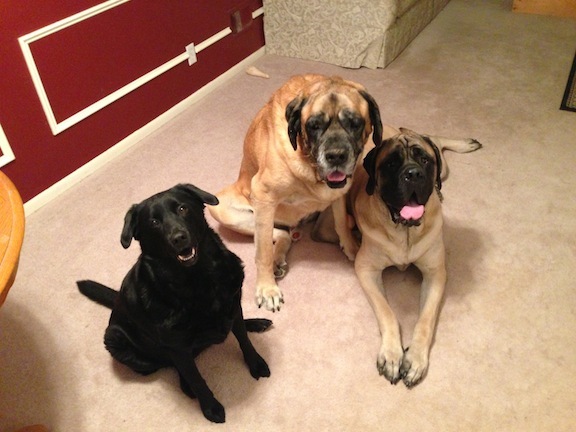 Their owner contacted me to help stop Sophie and Koda from getting over excited whenever any guests came over. When I arrived, Sophie and Koda met me at the door barking loudly and in a bit of a frenzied state. Koda was excited, but Sophie seemed excited and a bit territorial. I also noticed Sophie’s hackles were up. Usually this is a warning sign that gets my attention, but the thing that really stood out was Koda’s biting at Sophie when she got too excited. It was pretty clear that he was attempting to disagree with her behavior. This was my first clue that Sophie was the problem dog. When I sat down with their owners I had to chuckle a bit as there was a wooden platform / throne positioned right next to the couch. Their owners said they built that for Sophie so she could sit up and look through the window. The problem was the throne was higher than the couch. To dog’s, the height at which they sit has a correlation to their rank or level of authority. Because Sophie was sitting at a higher level than her owners, they were telling her she had more authority that she actually did. While I was explaining the height issue to her owners, both Mastiff’s took turns trying to rub up against me. Usually this is an attempt at scent marking, but in this case, it appeared that the dogs didnt understand the concept of personal space. Each time one of the dogs got too close, I stood up or stood up and walked into them to reclaim my territory or personal space. Some dog breeds are more physical that others. Bully and giant breeds often rub or bounce into each other. Thats fine for dogs, but not the best situation for humans, especially when the dogs are close to, or over, 100 lbs each. By standing up when they got too close, i was able to communicate that they were violating a boundary I wanted them to respect. It took a handful of corrections, but finally both dogs moved slightly away before sitting down. Because their owners hadn’t incorporated any rules into the dogs daily lives, they had no respect for their human owner’s authority. This is why the dogs didnt consistently respond when they were given commands or when the owners disagreed with a behavior. I suggested a few simple rules to help the dogs start to see themselves as followers who need to look to their humans for guidance and leadership. Things like not opening a door until the dog is in a sitting position or not petting the dog unless it follows a command like “sit” may seem like minor things, but when done consistently, they can have a big impact on how the dog perceives itself and its human’s authority. Since the majority of the dog’s over excitement was triggered by guests knocking at the door, I asked if the owners had a neighbor who could come over. Luckily the woman who lives next door was able to come by and help us out. As soon as they heard the doorbell ring, all three dogs rushed to the door, but it was primarily Koda and Sophie who were borderline out of control. I walked to the door and then turned to face them. The dogs continued to bark, so I walked into their space to back them away from the door. Koda responded right away by moving off, but Sophie “argued” with me for a bit forcing me to take more space away from her until she got to the boundary I wanted her to respect. As soon as she did, I turned and went back to the door. I paused a moment to see if they would cross the new boundary but when they didn’t I opened the door and invited the neighbor in. Sophie attempted to cross the new boundary but responded immediately and retreated when i disagreed with her. The neighbor told me it was the first time she had met the dogs in the house. Because of their behavior, the dog’s owners had gotten into a habit of always putting the dogs outside or in another room when company came over. While this solves the immediate problem, it doesnt help the dogs learn how to properly act when someone arrives. I suggested their owner’s call or text each other when they are on the way home so that they can practice this technique amongst themselves. Considering I only needed one correction, I suspect that the rushing and barking at the door will quickly become a thing of the past. Next I had their owners put Koda and Peyton in the other room as I could tell the dog that needed the most work was Sophie. I demonstrated a leadership exercise to help her see me as an authority figure as well as teach her to restrain herself. Sophie “argued” with me again for this exercise, but after about eight corrections she stopped and surrendered to my authority. As soon as she did I immediately rewarded her, then repeated the exercise a few more times. Each time she protested less and less until she didn’t bark or protest at all. At that point I walked her owner’s through the exercise so they can practice it with her and the other dogs over the next week or two. Now that their owners know how to communicate with the dogs effectively, they will be able to incorporate new rules to help the dogs see themselves as followers. It will take some time and practice, but there is no reason that the improved behavior the dogs were showing at the end of the session cant become permeant.